Kool Kut Soluble Cutting Oils are used where rapid heat removal is the major requirement. When diluted with water, they produce stable emulsions which have excellent cooling ability and the necessary balance of lubricity and extreme pressure characteristics required for proper machine conditions. Kool Kut 1 is a general purpose EP nitrate free emulsifiable cutting oil which forms a milky white emulsion when added to water. Kool Kut AL is a full synthetic, biostable non-staining cutting fluid, formulated for a wide range of applications on non-ferrous metals such as aluminium, magnesium, copper, brass and bronze. 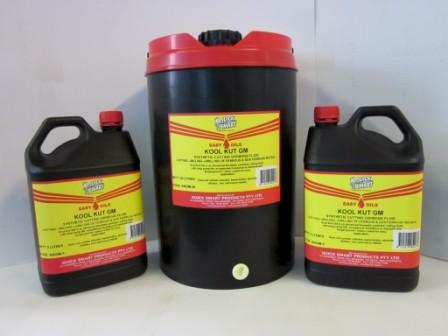 Kool Kut GM is a full synthetic grinding/cutting fluid for ferrous and non-ferrous metals, has a long sump life, exceptional resistance to bacterial and fungal growth and colour coded for easy application. When a full synthetic coolant is needed. 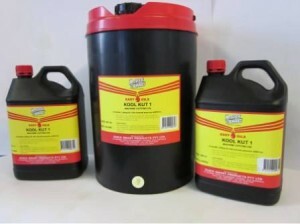 Kool Kut Full Synthetic Sawing Fluid is formulated specifically for band sawing and grinding applications. This is a high quality sawing fluid that will increase tool life significantly, when mixed with a water ratio of 7:1. Kool Kut Full Synthetic Band Sawing Fluid is formulated to help prevent chip build up, allowing the chips to flow freely, preventing buildup in and around the critical parts of the machine such as behind the band wheels, the blade guide and the chip brush assemblies. This will improve the life of your regular wear parts by up to 30% and help keep your machine clean. 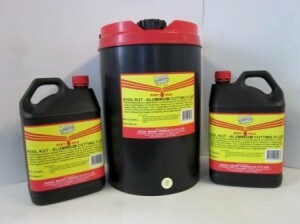 Kool Cut Full Synthetic Band Sawing Fluid is non-foaming fluid that has a long tank life. It’s clean odour free formulation does not contain chlorine, sulfur or silicone sulfates; making it biodegradable and operator friendly. This is an excellent sawing and grinding fluid used on most metals except magnesium. Mixing Ratio 7:1 Always add fluid to water.